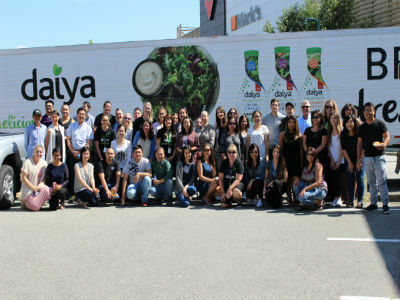 This month, Flip paid a visit to Daiya Foods, a plant-based dairy alternative manufacturer in Vancouver. Since last year, FoodMesh has worked alongside Daiya to help facilitate over 210,000 meals worth of Daiya products to food insecure community members valuing over $145,782.48 of plant-based goodness. Flip went on a mission to discover what Daiya did to become a food recovery powerhouse. In recent years, various corporations have become increasingly aware of their impact on the environment and their responsibility towards preserving resources. With this widespread awareness, corporate values have expanded to include local, national, and global communities, making corporate social responsibility an integral part of their purpose. Daiya operates with a sense of responsibility towards their community and environment, striving to make plant-based food as accessible as possible. As the company continues to expand, they encountered difficulties in efforts to divert food waste and optimize donations.This is where we come in, FoodMesh is continuously on the lookout to help organizations feed more mouths than dumpsters. FoodMesh was clearly a match for Daiya, leading to an alliance with Daiya joining our network as a Visionary Founding Partner. Daiya utilizes lean manufacturing practices, but large scale production often results in products that are non-uniform but still perfectly safe to eat. Often times, Daiya Foods has surplus food in stock from a different season. As an environmentally conscious organization, they choose to donate surplus food rather than send it to the landfill. Finding charities that can accept large donations of Daiya products is a task in of itself. Daiya’s employees had to research organizations, reach out to see if they could accept large quantities, and ensure that they had the resources to receive, store, and distribute refrigerated and frozen products. Daiya also faced difficulties in keeping track of how much product it donated and how the donations were distributed to the charity organizations. Upon joining FoodMesh, Daiya can now easily list, connect, and track donations. Posting a listing has never been easier with FoodMesh’s clone feature. Once a product has been uploaded, Daiya is able to set up recurring listings through our clone feature, efficiently streamlining the donation process.What was once a time-consuming process, can now be accomplished in a few clicks. On FoodMesh, suppliers are able to view the profile of charities they wish to donate to and create a list of verified channels, if there are specific organizations they want to support. In one donation, Daiya Foods was able to quickly distribute four truckloads of dairy-alternative products to a food bank through our network. Daiya sees donation and diverting food waste through food recovery as an important, multi-beneficial piece of solving the hunger problem in the local, and global communities. Being a part of the local food recovery movement has also brought other perks to Daiya. Increased customer satisfaction and employee engagement are among a few of the benefits that Daiya has witnessed within the organization. Organizations that put the best interests of employees, customers, communities, and the environment at the forefront of their goals and strategies see immediate benefits not just internally, but externally as well- creating a win-win situation. On top of that, the food recovery movement has major cost benefits, as it saves the organization from having to pay for de-packaging and composting and allows for higher uses of the products. With the help of FoodMesh, Daiya Foods aims to continuously provide food products to charities not just locally, but across Canada. As they continue to grow, Daiya aims to utilize their newfound resources to increase accessibility to plant-based food and give back to the community in meaningful ways and we hope to continue to help them achieve their mission.